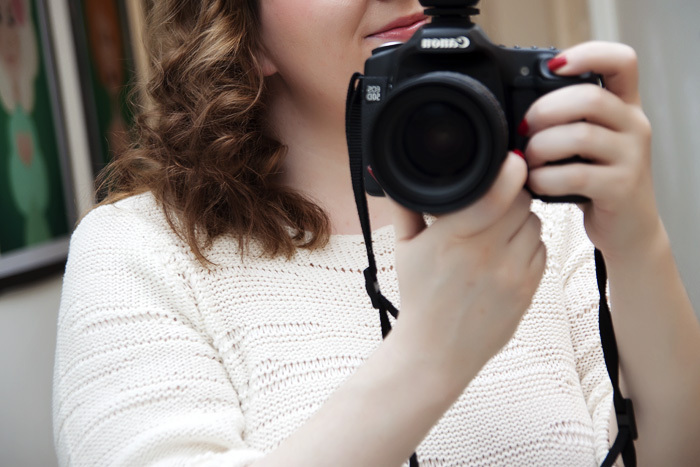 A Makeup & Beauty Blog – Lipglossiping » Blog Archive Cloud Nine The Wand waves a magic spell on my hair! Following on from Saturday’s “I want a perm!” declaration, I thought I’d let you know what prompted this revelation. I used a styling wand! 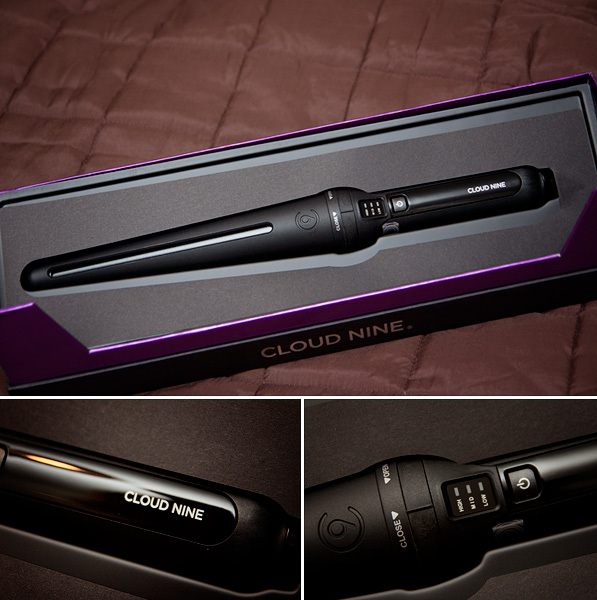 And not just any old styling wand but one that is generally considered a bit of a posh styling wand, the Cloud Nine version. It’s a bit of a chunky beast with a large tapered barrel and a heavy-duty, solid handle. The wand comes complete with a protective sheath that slides over the heated barrel and protects fingers/surfaces from burns and damage when the tool isn’t in use. The Cloud Nine The Wand certainly isn’t for the faint-hearted (or weak-wristed), it quite heavy and takes a little practice to wield comfortably. I don’t mind admitting that it took not one, but two ear burns (matching) before I realised that at least one secret can be found in a simple solution: for the love of God, do not move or angle the tool once it’s cms from your skin, move the hair. MOVE THE HAIR, NOT THE TOOL. Are we clear on this? Good. The tapered barrel allows for a good amount of volume at the root of the hair, and as you wind the hair toward the tip of the barrel, the curl will become tighter. 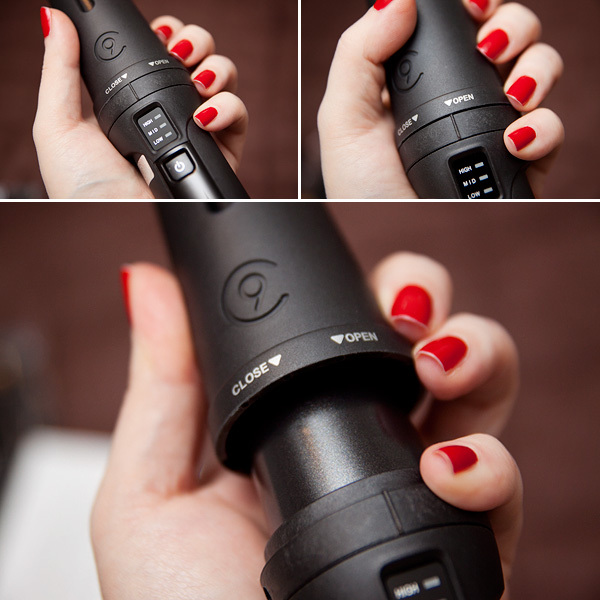 The controls are simple and easy to master, the wand gives you complete control over the temperature you’re using, which is great for anyone whose hair frazzles at standard settings. My fine hair generally responds pretty well at low temperatures, so for obvious reasons, I’m relieved that The Wand (like their straighteners) gives me the option to turn down the heat. If you’ve got coarse hair, by all means… crank that baby up. The Cloud Nine wand also comes complete with a heat-resistant glove, this took away THE FEAR and ensured that I could wind each lock around the barrel right to the tip, there were no straggly straight bits for me! 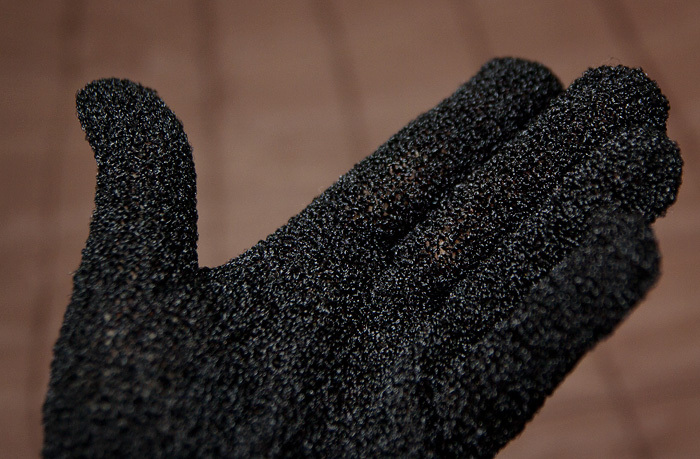 Plus, just having one glove in your possession is total justification for trying out any Michael Jackson impressions that you’ve been secretly stifling over the past 31 years. Not that I did any. Ow! Cloud Nine are currently campaigning for women to be kinder to their hair by having “off” days. I have plenty of “off” days but after reading the press release, I realised that weren’t thinking along the same lines. According to Cloud Nine, you can treat your hair without compromising on style simply by rethinking your “2nd day” look. 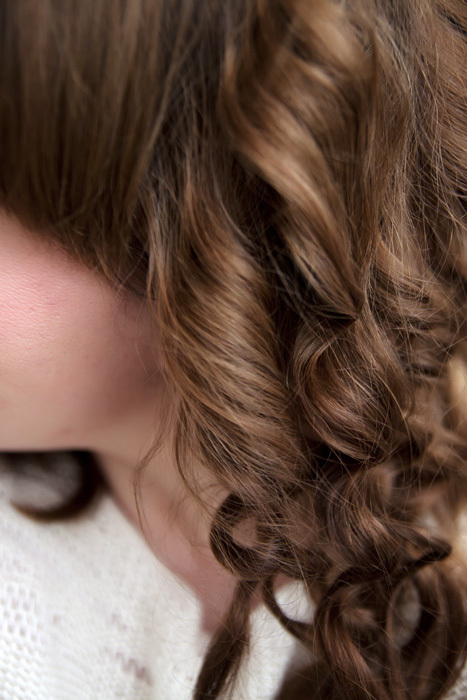 An example of this would be curling your hair on day 1, wearing the curls to their full-potential before using day 2 to be kind to your hair, leave the heated tools on the dressing table and simply wearing your hair in a half up/half down style with loose waves (the remainder of day 1’s curls) keeping you looking stylish. 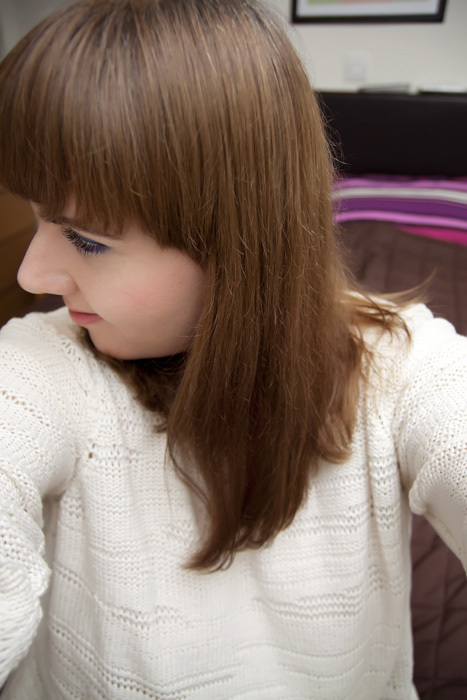 So anyway, onto my before and after… here’s my hair in all its uber flat, just washed and dried glory. Boring. The above photo shows the curls before I’d separated them with my fingers. I was a little haphazard because I wanted to accurately reflect how I’d use the tool. I’m not the kind of girl who has the patience to part her hair in a thousand different directions, pinning each section up and spritzing with heat defence. I’m the kind of girl who sprays half a bottle of heat defence, brushes it through, before randomly taking sections (that may or may not be completely different sizes) and curls. That’s me. I’m a crapiologist, and this still came out looking good. So there you have it, I really like this… for one major reason. I could achieve proper curls a couple of times a week without wanting to gauge my eyes out in frustration. I’m not a hair person, I’m rarely happy with my hair but I hate fussing even more. So much so… that I’m already contemplating a one-off perm so that my hair can look like the above without me doing ANYTHING at all. Except, I know that it won’t work out like that and I’ll emerge from the salon looking like little orphan Annie, so as an alternative to not having to do anything at all, the Cloud Nine wand has proven itself to be a genuine solution to achieving great curls with the least amount of fuss, even on low heat. Now as for that 2nd day hair… well, I could have done half-up/half-down, but that’s how I wore my hair to school, so screw you 2nd day hair. Instead, I cheated and used an old-skool setting lotion. Take that! No waves for me, these curls lasted until I had to wash the buggers out ha! As a curly-haired person, I can assure you that the ‘gah!’ factor is still very definitely there when you have curls from the get-go in the morning. For a start, that ‘second day’ had better not include a hairbrush or you will have a big ol’ attack of The Frizzies and spend the day looking like a gonk. I hate to say this but that is exactly what I do on the day between washes. I was 21 when I first realised I had the most amazing hair – I’m now 47 and it’s still the same – long, thick, curly … oh and red! I love the look of this, and love using a wand on my hair. Cloud Nine straighteners are brilliant so it’s good to see the wand keeping up with them. Loving those curls! My daughter is on a ‘curl obsession’ at the moment. What setting lotion did you use? I used the one which came with my curling wand, but now it’s finished and the wussy one I bought at Superdrug just doesn’t cut it. Her curls lasted all of 6 hours at the most. I use the Clynol one, I buy it on eBay though. It’s called Clynol Style Set Extra Strong. Comb it through once it’s on or you could decant into a spritzer bottle to ensure even coverage. I’ve got a recommendation for you though! These are fantastic: http://dx.com/p/salon-hair-pp-plastic-rollers-curlers-set-16-curler-56586 – If she’s got long hair, get two sets. They’re basically a rip off of a product called Curl Formers which you may have heard of. If not, get theeself on You Tube and watch a tutorial. I put them in when my hair is wet (not damp, wet) and then sleep in them. If she has trouble sleeping in them (they’re like uncomfortable rags), you can put them in and then blow dry on low. My hair always drops, and these are the best heat-free solution I’ve found. Here’s the irony, I know some wavy-haired folks who ended up getting these Japanese/Korean perms so that they could do that tumble out of bed and look fab thing. Especially hair that don’t wave uniformly. Or start developing cow licks at certain lengths. I have stick straight hair. So straight that even my stylist from home in South East Asia had to ask me if I had chemically straightened my hair when we first met. I’ve had these special perms done once or twice a year in recently years and it really helps me ‘get up and go’. Because with stick short straight hair, bed head is a real issue too because unless you wash it and restyle, it is impossible to get rid of tell-tale cow licks and bumps. My perm has grown out quite a bit and my stylist in London has cut to accomodate the perm so now I have a nice bob. But I actually have a heat styler to add more waves into my hair when it gets too flat from sleeping, something I can do with some kind of perm left. When I was searching for a nice straightener instead of continually buying ones that kept breaking from the local stores, I did a lot of research on Cloud 9. I finally decided to order the Cloud 9 straightener and LOVE it! I’ve had it for over 2 years now and I can say for sure that it definitely is the best straightener I own. So I was SO excited to see this review and your hair looks GORGEOUS!